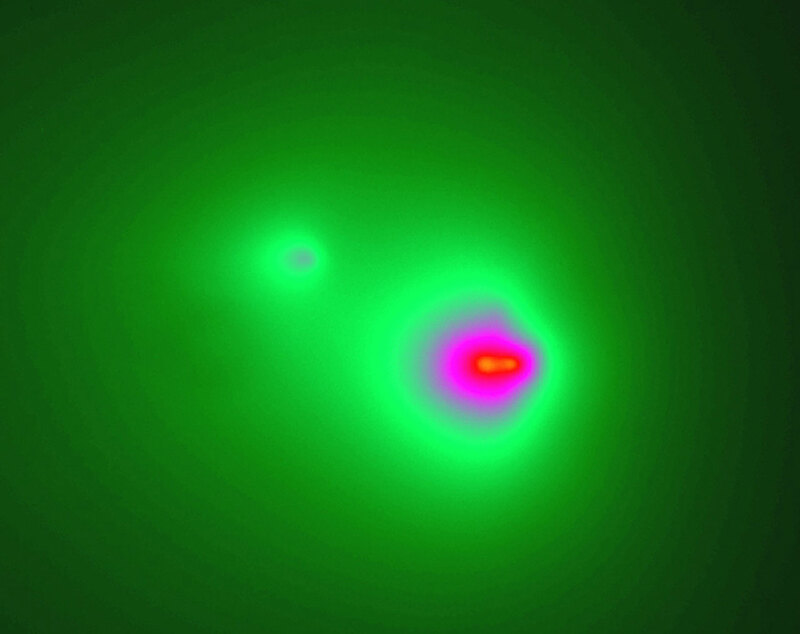 New images from the VLT show that one of the two nuclei of Comet LINEAR (C/2001 A2), now about 100 million km from the Earth, has just split into at least two pieces. The three fragments are now moving through space in nearly parallel orbits while they slowly drift apart. This comet will pass through its perihelion (nearest point to the Sun) on May 25, 2001, at a distance of about 116 million kilometres. It has brightened considerably due to the splitting of its "dirty snowball" nucleus and can now be seen with the unaided eye by observers in the southern hemisphere as a faint object in the southern constellation of Lepus (The Hare). Comet LINEAR was discovered on January 3, 2001, and designated by the International Astronomical Union (IAU) as C/2001 A2 (see IAU Circular 7564 ). Six weeks ago, it was suddenly observed to brighten (IAUC 7605 ). Amateurs all over the world saw the comparatively faint comet reaching naked-eye magnitude and soon thereafter, observations with professional telescopes indicated the reason for this strange behaviour: the comet's "dirty snowball" nucleus had split into two pieces (IAUC 7616 ). During the splitting of the nucleus, fresh material from the interior of this frozen body is suddenly exposed to the sunlight, causing a rapid increase in the evaporation process. 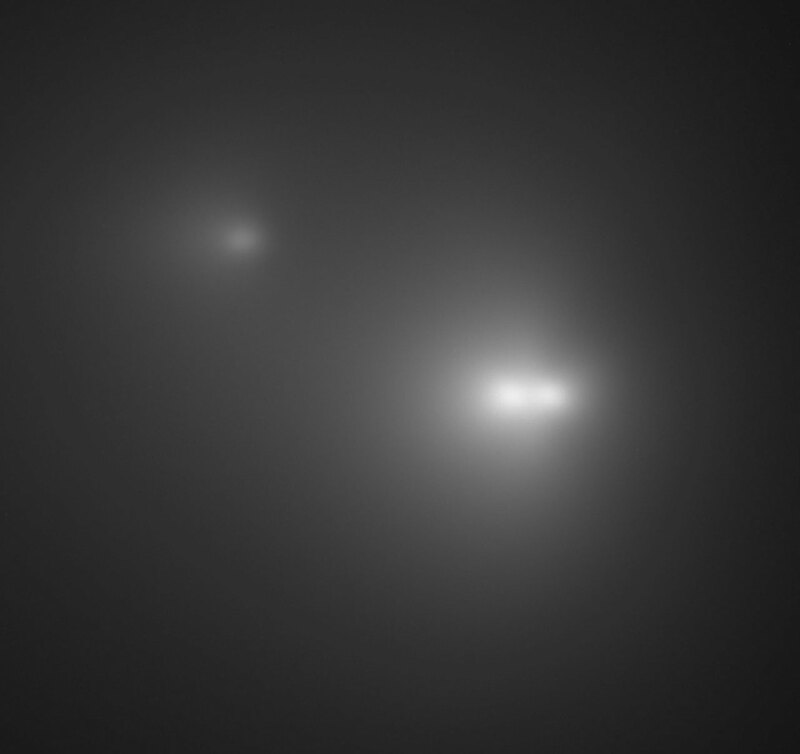 More cometary material is released and the overall brightness increases, as more sunlight is reflected off the dust around the nucleus. But Comet LINEAR has just shown that it is good for another surprise. When astronomers at ESO's Paranal Observatory  turned the 8.2-metre VLT MELIPAL telescope (UT3) towards that object in the evening of May 14, they noted that one of the two pieces of the nucleus appeared somewhat elongated. The comet is rapidly approaching the Sun - it will pass through its perihelion (the point closest to the Sun) on May 25, and it was quite low in the sky (about 20° above the western horizon). Accordingly, the image quality was not perfect, but there was no doubt that something was going on with the fragment that was closest to the Sun (denoted "B"). And indeed, when the 8.2-metre VLT YEPUN telescope (UT4) obtained another image of the comet in the evening of May 16, it was obvious that fragment "B" had split into two, see ESO Press Photos eso0119. In fact, the astronomers suspect that there may be other, smaller pieces. The distance between the two pieces of nucleus "B" of Comet LINEAR (now denoted "B1" and "B2") was only about 1 arcsec, or approximately 500 km (projected) at the present distance of the comet from the Earth (about 100 million km). The distance between these and the other nucleus ("A") increased from about 6000 km (May 14) to 7000 km (May 16). The ESO astronomers have reported their detailed findings in IAU Circular 7627 . They also note that the shape of the bright cloud (the "coma") around components "B1" and "B2" is quite unsual - this is well visible on the false-colour ESO Press Photo eso0119b . They interpret this as the likely presence of a large amount of gas in addition to the dust around these fragments. Comet LINEAR moves in an exceedingly elongated orbit and it is making one of its first approaches to the Sun, perhaps even the first one. It is therefore a "new" comet in which unaltered material from the formation of the solar system some 4.5 billion years ago may still be present. For this reason, the splitting of its nucleus is of particular interest to the astronomers: by spectroscopic observations, they may be able to observe directly such material and hence to learn more about the processes that took place at the time of the formation of the solar system. Interested observers may find the location of this comet in the sky (the "ephemeris") at the May 2001 Events webpage at Sky & Telescope . Last year, the nucleus of another Comet LINEAR (designated C/1999 S4) disintegrated completely. It was observed extensively with the ESO VLT and the Hubble Space Telescope (HST), c.f. ESO Press Photo eso0026. Quite by chance, a series of research papers based on those and other observations of that comet are being published in today's issue of the research journal Science. Information about this comet has been published by the IAU Central Bureau for Astronomical Telegrams (CBAT) on several IAU Circulars : IAUC 7564 (discovery on January 3, 2001 and provisional orbit); IAUC 7600 (ephemerides and brightness estimates; March 20, 2001); IAUC 7605 (observations of a rapid brightening; March 30, 2001); IAUC 7611 (brightness estimates; April 19, 2001); IAUC 7616 (first observations of splitting into two fragments on April 30, 2001); IAUC 7620 (brightness estimates; May 5, 2001); IAUC 7625 (some brightening of component "A" on May 9-10, 2001); IAUC 7627 (detailed report on the ESO VLT observations described in this Press Release; May 17, 2001). These observations were made by Emmanuel Jehin, Andreas Jaunsen, Hermann Boehnhardt, Mario Kiekebusch, Hernan Nunez, Rodrigo Amestica, Christian Herrera, Francisco Delgado, Julio Navarrete (ESO VLT, Chile) and Richard West (ESO Garching, Germany).